Even with an uncertain future facing the platform, HP has just announced a new TouchPad-related deal via a joint promotion with retail giant Best Buy. This latest "deal" offers consumers a $150 32GB TouchPad (HP's standard, non-bundle clearance price) with the purchase of select HP or Compaq Desktop, Laptop, or all-in-one PCs at Best Buy. This offer is set to begin November 1st, and will be available through Bestbuy.com and all brick and mortar retail stores nationwide. No word on the quantity of units available for this promotion or an effective end date for the promotion, though speculation is running rampant that these TouchPads are part of the "final batch" of TouchPads promised back in August. Try again. 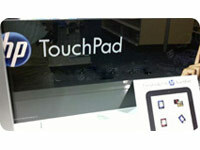 HP should have marketed the TouchPad this way when they first decided to blow them out. Now, anything more than the no-strings-attached $99 and $149 pricing seems "expensive". RE: Ha Ha Ha Ha Ha Ha!!! 3. Agreed wholeheartedly. If the TP had arrived on the scene within 12 months of iPad 1 it would be have been (mostly) fine. If it had arrived mid-2011 in its current formfactor but undercutting the iPad2 by $100 or more, it would be acceptable. But to go head-to-head with the iPad 2 at the same price points was doomed to failure from the start. I still give props to HP for the superb audio quality and having the sense to go with a conventional microUSB charger port. 6. Yep. Too bad they didn't flood the market with these unlocked for $150 from the start. 7. Ditto. Centro was almost perfect. A proper Centro 2 that was a little bit thinner, had a slightly larger screen, a 3.5mm headphone jack and the 128MB style "squishy" keys would have been an awesome device. It's still amazing how much Palm was able to pack into the "cheap" Centro in 2007--tons of worthwhile pre-loaded software, expandable storage, removable battery, a d-pad, QWERTY keyboard, legacy Athena and 2.5mm connectors, IR port, ring/vibrate switch etc etc etc. 9. Yep. A thin all-touchscreen 3.4" or so Veer would have been a really nice little device. But WebOS is already cramped on a Pre's screen with a physical keyboard. Adding a virtual keyboard to the mix would probably have made things nigh unusable. 10. I LOVE the monster phones, especially of the LTE variety, and consider 4.7" or so the upper limit of pocketability, as long as they don't start sacrificing expandable storage and removable batteries (a trend that is sadly becoming uncomfortably common on the latest Android devices). As someone who juggled/fumbled with 2 devices ever since the days of carrying an original Pilot alongside a clunky MicroTAC, even a "big" smartphone with an extended battery is manageable. There's room in the market for both mini and macro phones (though perhaps not in the mindshare of US consumers). It's just a shame that we are so beholden to the carriers here in the USA and cannot pick and choose a variety of unlocked devices/formfactors at retail for our phones. I don't think Rim can pull the plug on the Play book. It's the only hardware out there that they have running the new OS. It will be interesting to see who is where next year this time.